Months ago I wanted to start making my own kombucha. I was buying bottles of kombucha from the health store and the costs were adding up and I felt it was time for a cheaper way. 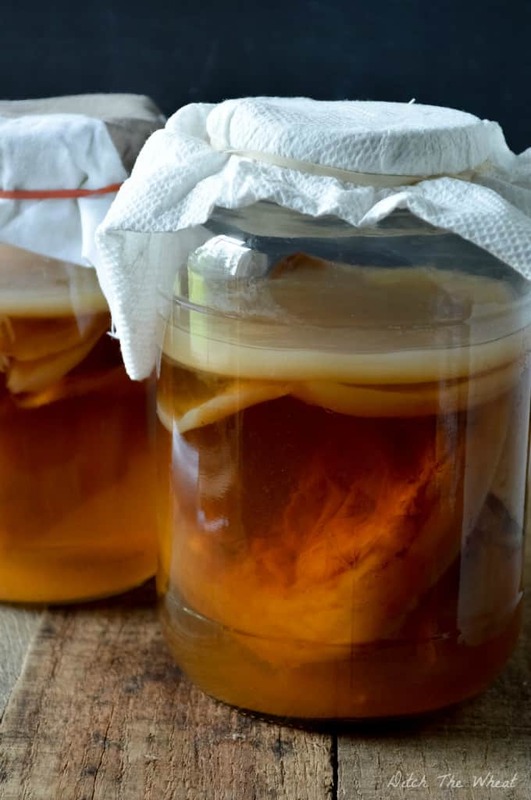 I researched a few ways for how to grow a kombucha scoby. A scoby is the white alien looking thing floating at the top of the jar. You need a scoby to ferment the tea to brew kombucha. The scoby eats the sugar you add to the tea and you end up with a beverage that tastes great and is full of probiotics and is great for detoxing. 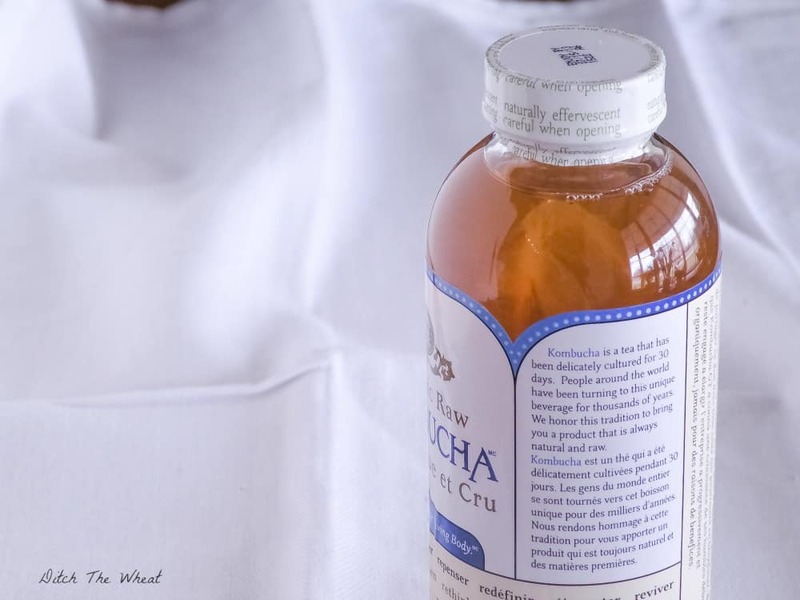 Bottle of Kombucha – This bottle also has a small scoby growing in it. Can you see it? Purchase a bottle of kombucha. The product must have an active bacteria culture and not be pasturized. When I was purchasing bottles of kombucha I noticed that some had a slimy thing floating in it. This is a baby scoby. Look for a bottle in the store that has one but it is not necessary. You can see the baby scoby floating at the top of the bottle. 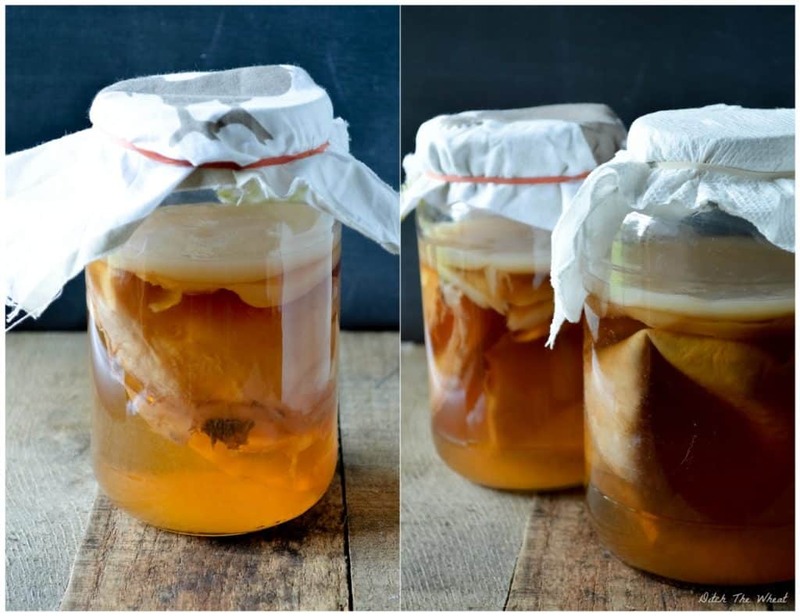 To grow a scoby you don’t need to brew gallons of tea, 4 cups of tea is enough. Bring to boil 4 cups of water. Add 4 green tea bags (or equivalent loose tea). Steep and remove the tea bags. You do not need to use green tea you can use black tea or oolong tea. I usually use decaffeinated green tea. I stress organic cane sugar (like this brand) because “regular” sugar is said to be GMO and here at Ditch The Wheat I try to advocate organic over genetically modified. Add 3/4 cups of organic cane sugar to the hot tea. You must use sugar instead of raw honey. The antibacterial properties of raw honey will not work with the fermentation process of kombucha. Stir the sugar until it is dissolved. Place the contents of the store bought kombucha into a 1 litre jar. 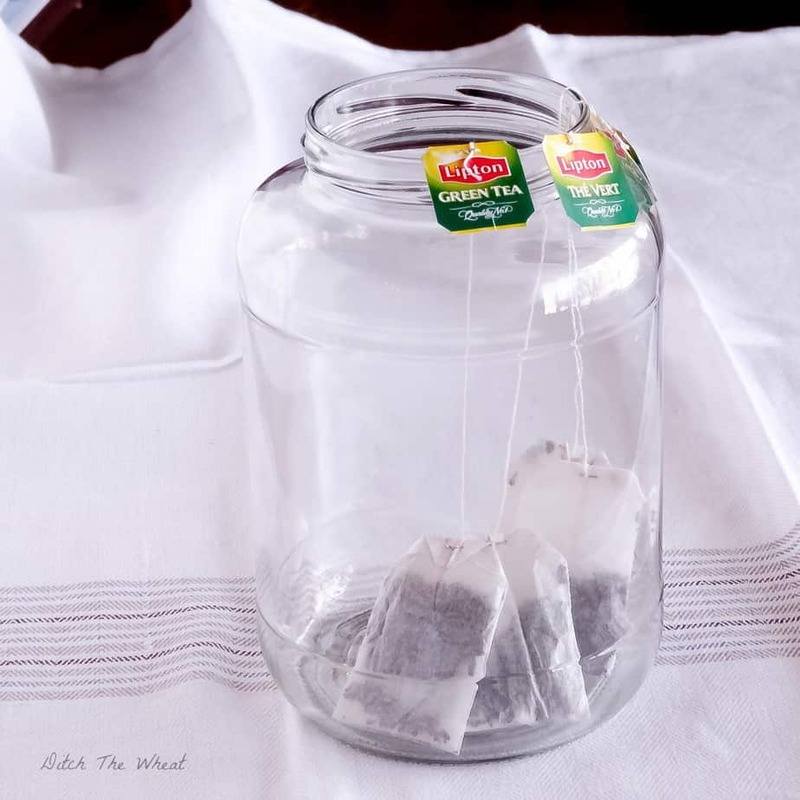 Add the room temperature tea to the jar. Cover with a cloth and use an elastic to secure it. 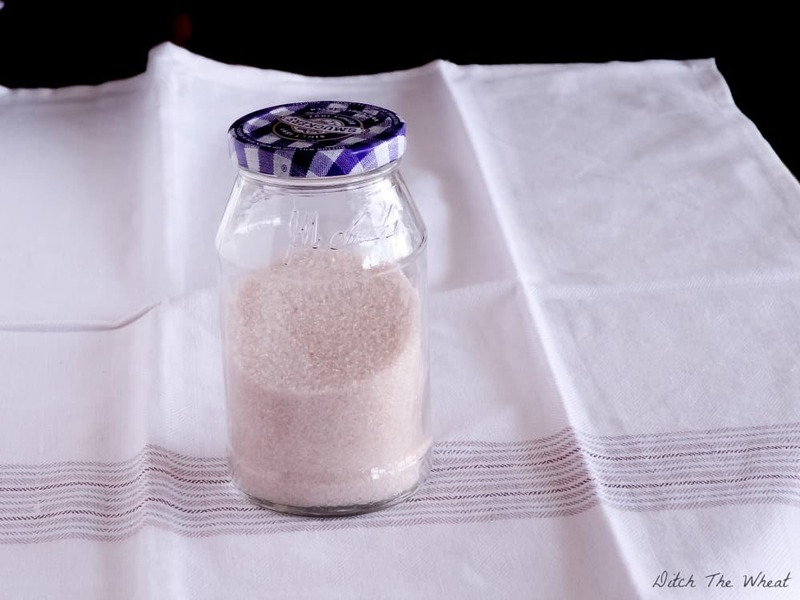 Place the jar in an area out of sunlight that is room temperature (not in the basement, it would be too cold to ferment) and now wait…. Do not move the jar until you have a thick scoby. For me this process took almost a month but I grew mine in Canadian weather in the spring. Friends of mine can grow a scoby in a week. It depends on how warm your house is. If the idea of taking a month to grow a scoby sounds crazy and it is a little, consider buying a scoby kit that comes with starter tea. How to Grow a Kombucha Scoby Step 5: You have a Scoby! When your scoby is grown you can now make kombucha with it. Scobies grown this way tend to be “ugly” scobies but they work just as well as a store bought scoby. The kombucha in this batch is not drinkable. Wait for the next blog post and I will share with you how to brew a batch of kombucha. Fruit flies invaded my batch of kombucha. Most articles on the internet suggested I throw out the batch and the scoby but I had one major problem, I never saved any of my scobies since I was only 2 months into making kombucha. I washed and scrubbed my scoby and placed it in a jar with kombucha I had filtered to make sure there were no more larva. My intention was to incubate the scoby to make sure there were no more eggs and then start brewing again. Something happened that I didn’t expect. A few new scobies formed and they formed fast and were thicker than any scoby I had previously grown (also the scobies were pretty and thick like you see in most pictures). Since then I have created what people call a scoby hotel. I keep a few backup scobies in a jar of kombucha and I store it in the fridge. If I ever needed a scoby fast I would use this method to grow one over the store bought bottle approach. 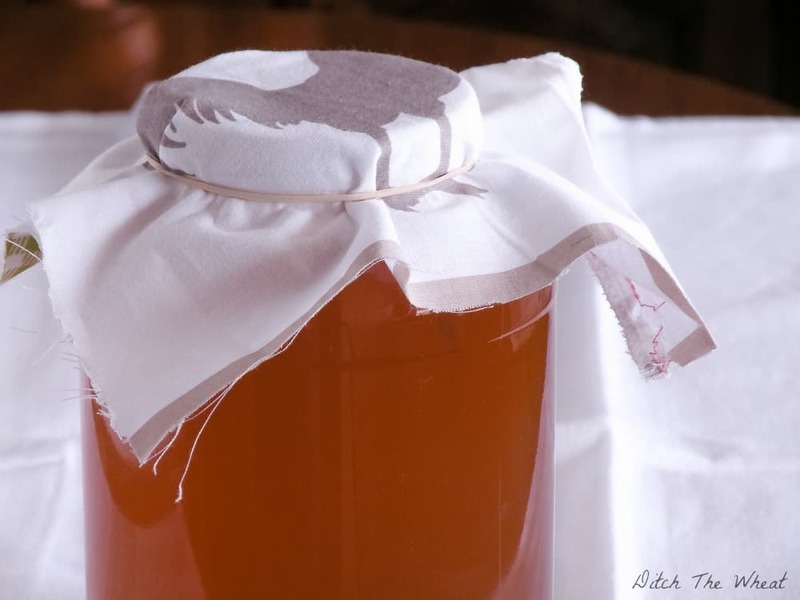 You would just take a large amount of kombucha (get some from a friend or use multiple bottles of store bought kombucha), pour in a glass jar, cover the top with a cloth and leave it in a warm place and wait for a scoby to grow. This method took me 1 week each to achieve the 2 scobies you see floating at the top of the jar but keep in mind I grew these in the summer and not the spring and therefore the house was warmer. I found this book very helpful for learning how to ferment various foods. Real Food Fermentation (found here on Amazon) focuses on a beginners guide to fermenting vegetables, fruits, drinks and meat. If you want to learn more about how to ferment foods you should look into Nourished Kitchen’s course, Get Cultured. Click here for more information. You can purchase a scoby and starter tea here. Great article! 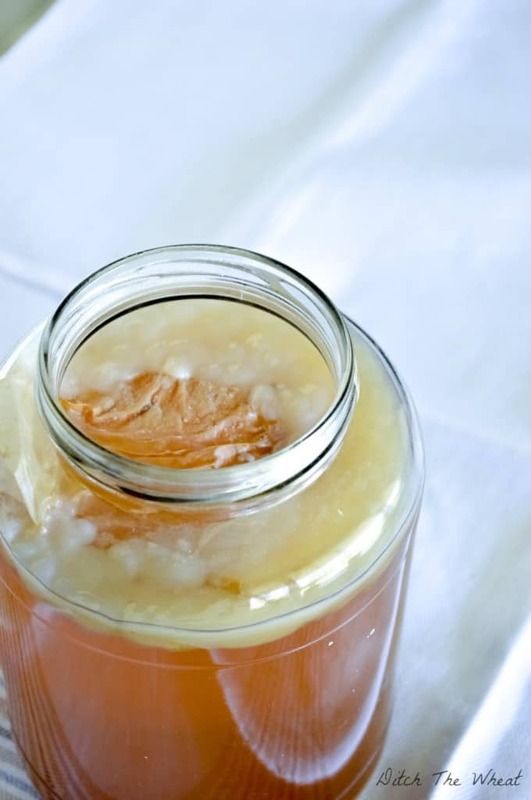 By the way, I LOVE your pics…I tried making my own scoby but modified your recipe a bit. Here’s my recipe . Just curious if you can you coconut sugar instead? Thanks. Not 100% sure. You’ll have to research it. Can you tell me what the thick stuff in the bottom of store brought kombucha is if the scoby is floating on the top? Thanks for your informative and in depth post! I’m a home brewer and have been trying to craft a beer that incorporates bucha, but I’ve never made bucha before. Now it appears I can brew beer and kombucha, albeit with a little patience, cheers! Why is the first batch not drinkable?